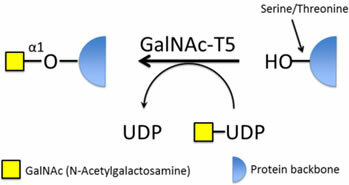 Polypeptide N-acetylgalactosaminyltransferase 5 (GalNAc-T5) catalyzes the transfer of N-acetylgalactosamine (GalNAc) from UDP-GalNAc to the hydroxyl group of serine and threonine residues, and was first cloned from rat (1). Twenty GalNAc-T genes have been identified in humans and most have been shown to represent active GalNAc-Ts. All isoforms are type II transmembrane proteins, with different but partly overlapping substrate preferences (2). The GalNAc-Ts control the initiation of mucin-type O-linked glycosylation and determine the location and density of O-glycans in a protein (2). Addition of GalNAc to an unglycosylated Ser/Thr residue creates the Tn antigen GalNAcα1-S/T, and subsequent addition of sialic acid by ST6GalNAc-I forms the cancer associated STn antigen (3). GalNAc-T5 expression pattern is highly regulated, and is most abundant in salivary glands (1). GalNAc-T5 has a preference for unglycosylated or monoglycosylated substrates (4). Ten Hagen, K.G. et al. (1998) J. Biol. Chem. 273, 27749. Formulation: Sterile filtered solution in 25mM Tris pH7.5 and 150mM NaCl, at a stock concentration of 477ug/mL. Enzymatic Activity: Measured by transfer of N-acetylgalatosamine (GalNac) from UDP-Gal to the peptide EA2 (AnaSpec Inc, Catalog # 63841), as measured with a phosphatase-coupled assay (R&D Systems EA001). Coupling assay reactions contained: 50mM Tris pH 7.5, 2mM MnCl2, 0.5mM UDP-GalNAc, 0.25mM EA2, 4ug/mL ENTPD3/CD39L3, and 6ug/mL GalNAc-T5 (serially diluted 1:2 for 3pts). Incubated at 37ºC for 30min. >500pmol/min/ug.